Description: NO MAGAZINE SALES into NEW YORK CITY. CONNECTICUT residents must furnish us a copy of your CT Eligibility Permit or ammunition certificate. This listing is forONEMagazine.Buyers can take any number of extras we have available at the same per-mag price.Buy 3 ships free: buy any 3 lots non gun non ammo and shipping is free!Here are factory10 round magazines for the Beretta model 84 Cheetah series pistols, that we found in an old New England warehouse. Each comes with its original packaging that has been opened in most cases. We estimate these magazines were manufactured in 2003 or 2004, just before the expiration of a certain federal statute in September of that year. Manufacturer is Fabricca d’Armi Pietro Beretta, S.A., of Gardone, Italy. Importer was Beretta USA of Accokeek, MD. Factory number is JM84F, marked on the package. Construction is steel body, spring, and tail plate, with black polymer floorplate and cartridge follower. Finish is matte blue body. Each magazine holds 10 rounds of .380 ACP caliber ammunition. That is 3 fewer rounds than the Mec-Gar number PB8413B. We normally stock the Mec-Gars, too, please see our separate listing. 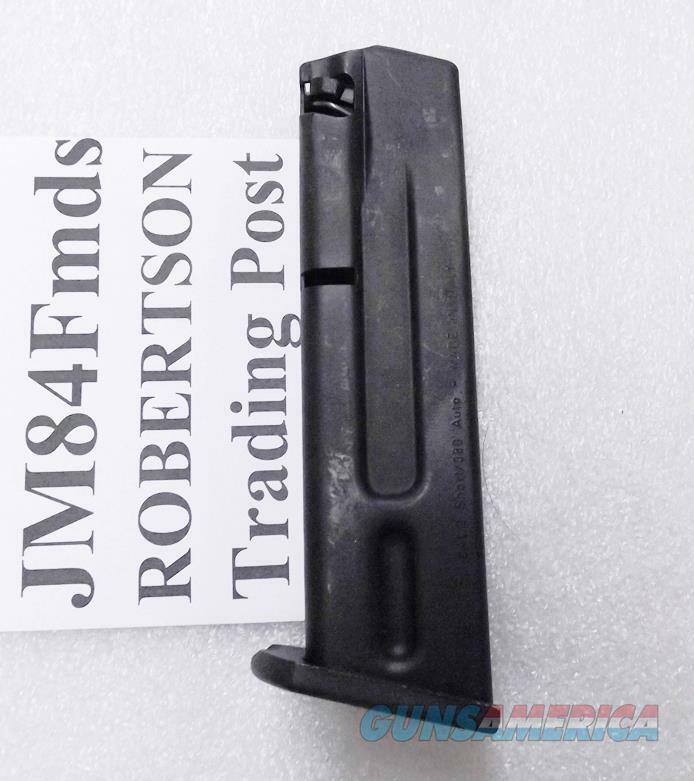 On the JM84F magazine, note the distinctive recess pattern to the body sides that prevent this magazine from holding three more rounds like its original version. This magazine is for any variant of the Beretta model 84 pistol. It does not matter whether a Beretta 84 has a BB suffix on its model number, or an FS Suffix, or the word Cheetah written on it. It will also fit a Browning BDA380 pistol, because Beretta manufactured the Brownings. It will fit the Girsan Chiappa copy of the 84 made in Turkey. It will not fit any other pistol besides an 84 Beretta, the Girsan copy, or a BDA380 Browning. Each magazine comes with its original factory packaging. We opened several magazines from this lot to remove dried grease from the surfaces. Packaging usually has some bent edges to its cardboard backs. Replacement pricing on this magazine from Beretta’s online store is $48.00. We’re offering them each, however,	for only	$26.00. Not for sale to residents of New York City. Any magazine deliveries into New York City require written permission from the Police Commissioner, so we cannot ship magazines into any of the five boroughs or 176 some odd zip codes, per NYC Code 10-131.10. Connecticut buyers must furnish us a copy of your State Issued Eligibility Permit or Ammunition Certificate, per P.A. 13-220. Any ammunition, firearms, or personnel showing in any of our photos are Not included. Grips, Magazines, Slings, Holsters, Scopes, Mounts, Parts , buy any 3 items and get Free Shipping! Guns and ammo excluded. Lower 48 only. Live checkout orders that qualify will have the shipping fee removed before the order is charged. Single items non gun non ammo, flat $10. $20 Flat Fee any shipment to Alaska, Hawaii, or Puerto Rico. Magazines, small light non-gun items ride free with ammo or gun orders. Checks OK, 7 day hold. GA Pay, MC, Visa, Discover phone- or fax-in 7 3 1 9 8 9 4 7 2 3 orders, USPS Money Order items shipped ASAP please put your full information, item number, and what the item is on any messages. Phone hours 8:00 - 430 CST Mon - Fri. Robertson Trading Post 117 Front Street PO Box 365 Henderson, Tennessee 38340. We buy, sell, and trade. Always have, since 1952.